We finally arrived in Morrow, Arkansas. We made the trip Tuesday and started revival that night. we had a great crowd and great service. This is our first time here and these fine folks made us feel very welcome. We will only be here four nights but we are anticipating a move of God. 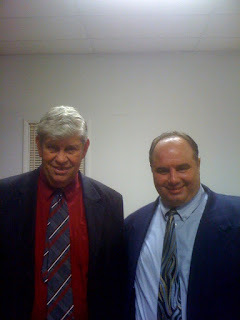 The first Picture is Pastor Ronnie Cooper and myself. The second picture is the the BoggsMobile parked on a hillside. 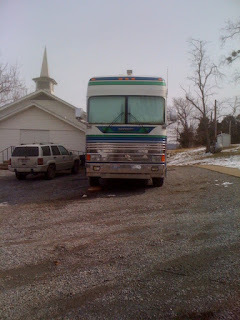 I couldn't get in to the place they normally park evangelist because of the mud from the snow and ice melt off. So we are parked at Mt. Pleasant where Bro. Cameron Hudson is the pastor. We appreciate their kind hospitality as well.